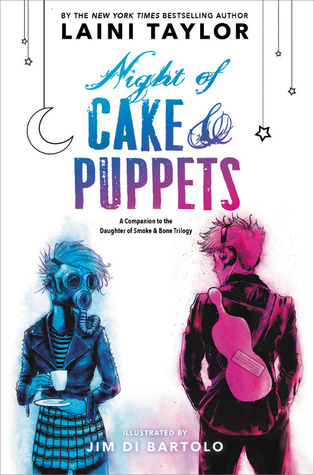 ‘Night of Cake and Puppets’ by Laini Taylor was adorable. Synopsis: Petite though she may be, Zuzana is not known for timidity. But when it comes to the simple matter of talking to Mik, her courage deserts her. Now, enough is enough. Zuzana is determined to make the first move, and she has a fistful of magic and a plan. It’s a wonderfully elaborate treasure hunt of a plan that will take Mik all over Prague on a cold winter’s night before leading him to the treasure: herself! This is a short story and there isn’t much to review. I don’t know how Laini’s able to talk about the things everyone thinks about but don’t know how to say. She’s a real wordsmith and I’m in envy of her ability to succinctly express those thoughts and emotions, especially in the area of first love and first kisses. There were so many times through this novella that I thought ‘That’s exactly it! I know how that feels!’ and it might not seem like a big thing. It’s what you expect every author to be able to do – but I swear to you, not every author can do it and certainly not to this attention to detail. After reading this, I definitely have a new appreciation for Zuzana and Mik and I wonder how I’d view them if I reread the Daughter of Smoke and Bone trilogy knowing how they met and how they spent their first date. And can we discuss this date please?! Talk about creative and magical. Even if you took away the wish magic, it would still be a great first date and it’s so romantic. Laini did a wonderful job with this and the illustrations brought all of her words to life. The added visuals made the story even MORE magical, if that’s even possible. It’s such a beautiful project by two people very much in love, telling a story of first love.